Marjolein Drent, Department of Respiratory Medicine Maastricht University Medical Centre (MUMC), ild care centre, the Netherlands (m.drent@mumc.nl). Failure of patient response to conventional therapy or the presence of unacceptable side effects from other available drugs, especially prednisone constitute the most common reasons for prescribing an anti-TNF agent for sarcoidosis [1,2]. Patients who present with significant respiratory impairment frequently require long term therapy. In these cases, to minimize corticosteroid usage and toxicity, one might consider concurrent usage of a steroid sparing agent, such as methotrexate . Despite these agents, a group of patients will experience persistent disease for which an anti- tumour necrosis factor (TNF) agent should be considered. Among the biologic agents which inhibit TNF-α, infliximab has been studied most extensively in sarcoidosis with fewer reports available for adalimumab [2,3,4]. Less is known about the efficacy of adalimumab in refractory sarcoidosis. 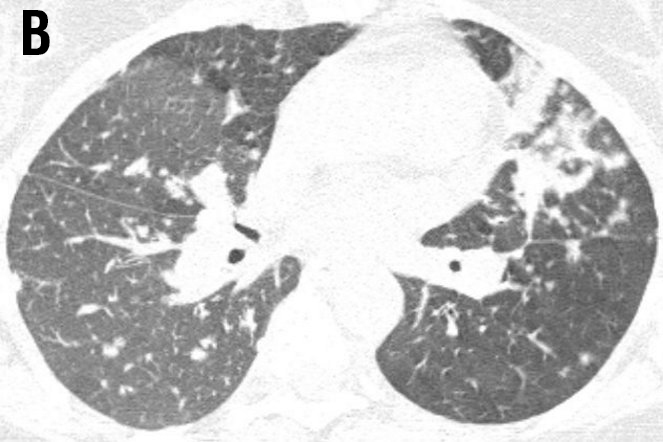 A 40-year-old female was referred to the ild care centre of the MUMC (a tertiary referral centre for sarcoidosis in the Netherlands) with refractory sarcoidosis. She was suffering from severe fatigue, shortness of breath on exertion, coughing, arthralgia and skin lesions, and also described exercise intolerance. She had no other medical history of note. An open lung biopsy showed non-caseating granulomatous inflammation consistent with the diagnosis sarcoidosis. Initially, she was treated with prednisone starting with 40mg daily. As this did not reveal a clinical improvement methotrexate was added (12.5mg once a week together with folic acid 5mg also once a week). However, this was without benefit, she deteriorated and responded neither to corticosteroids nor to methotrexate. At that time radiography and high resolution CT scan of the chest showed enlarged mediastinal en hilar lymph nodes and diffuse intrapulmonary lesions (figure 1 a and b). 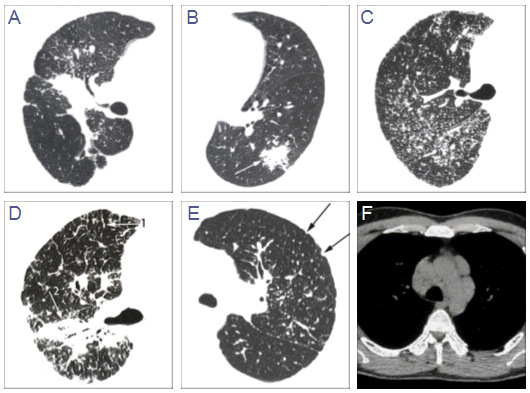 Figure 1 Radiography and high resolution CT (HRCT) scan of the chest showed enlarged mediastinal and hilar lymph nodes (LN: 3) with intraparenchymal nodules (ND: 2), septal and non-septal lines (LS: 2) thickening and irregularity of the bronchovascular bundles (BVB: 1); parenchymal consolidations( PC: 3; including ground-glass opacifications) with focal pleural thickening (PL: 1), respectively (total visual Oberstein score (7,8) 13; Figure 1A). Figure 2 HRCT after six months treatment with adalimumab showing improvement; Oberstein score: LN 2; ND 1; LS 2; BVB 1; PC 1; PL 0; total score 7 [5,6]. Figure 3 HRCT findings in sarcoidosis adapted from Oberstein et al., visual score. A Thickening or irregularity of the bronchovascular bundle (BVB). B Parenchymal consolidation (including ground-glass opacifications). C Intra-parenchymal nodules. D Septal and nonseptal lines (1→); BVB (2→). E Focal pleural thickening (arrows). F Enlargement of the lymph nodes. Laboratory tests were normal except the soluble IL-2-receptor was increased (3981 kU/L). The lung function test were abnormal. Therefore, adalimumab was started, initially 80mg and than 40mg once a week subcutaneously. Methotrexate was also continued (7.5mg once a week). After six months her fatigue and arthralgia were less prominent and her quality of life (QOL) improved a lot. The FEV1 was enhanced from 42% to 58% of predicted, the FVC from 77% to 92% of predicted and the DLCO from 75 to 79% of predicted. The six-minute walking distance improved from 600 to 630 meters. More important, before the treatment she desaturated to 82%, and this did not happen anymore the last time she was tested. The HRCT also improved (figure 2 a and b) [5,6]. This is the first case highlighting that adalimumab improves respiratory functional impairment, pulmonary damage including HRCT abnormalities (figure 3 A-F), inflammatory characteristics, as well as extrapulmonary involvement, QOL and reduces fatigue in a patient suffering from refractory pulmonary sarcoidosis. Adalumiumab might be considered as a good alternative for infliximab in sarcoidosis. Adalimumab appeared to be a good alternative in the treatment of a sarcoidosis patient with severe pulmonary involvement not responding to the conventional therapy. To evaluate the real benefit of sarcoidosis patients and efficacy of adalimumab, a prospective study should be conducted. Iannuzzi MC, Rybicki BA, Teirstein AS. Sarcoidosis. New Engl J Med 2007; 357: 2153-65. Baughman RP, Lower EE, Drent M. Inhibitors of tumor necrosis factor (TNF) in sarcoidosis: Who, what, and how to use them. 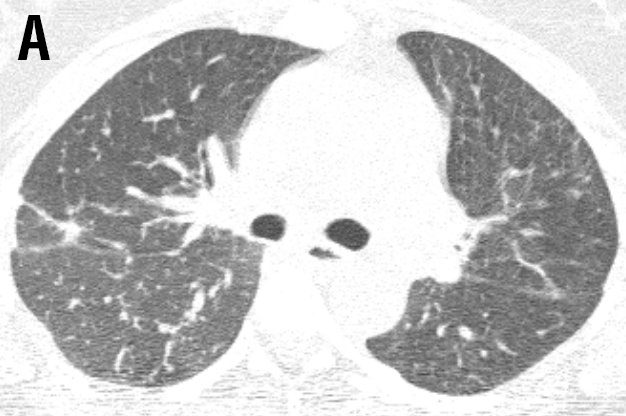 Sarcoidosis Vasc Diffuse Lung Dis 2008; 25: 76-89. Baughman RP, Drent M, Kavuru M, et al. Infliximab therapy in patients with chronic sarcoidosis and pulmonary involvement. Am J Respir Crit Care Med 2006; 174: 795-802. Oberstein A, von Zitzewitz H, Schweden F, Müller-Quernheim J. Non invasive evaluation of the inflammatory activity in sarcoidosis with high-resolution computed tomography. Sarcoidosis Vasc Diffuse Lung Dis. 1997; 14: 65-72. Drent M, De Vries J, Lenters M, et al. 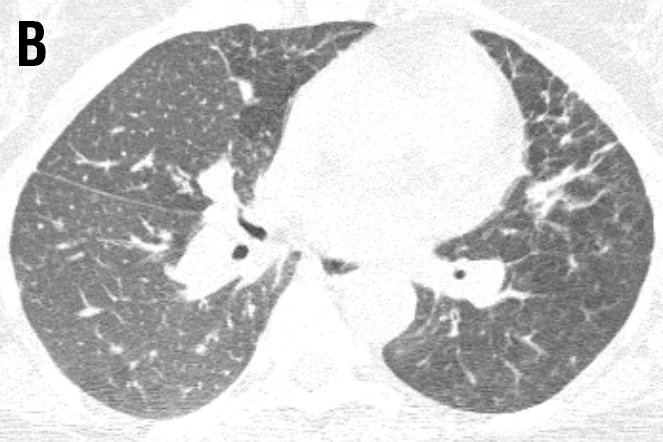 Sarcoidosis: assessment of disease severity using HRCT. Eur Radiol 2003; 13: 2462-71.